The Respiratory Department provides specialist care for a wide range of respiratory conditions such as Chronic Obstructive Pulmonary Disease (COPD), asthma, lung cancer, cystic fibrosis, sleep apnoea and many other conditions. We provide specialist outpatient clinics, lung function and sleep tests, as well as inpatient care when needed. We are part of the Canterbury Clinical Network and work together with community providers to support people with respiratory illness. Ward 25 is situated on the second floor of the Riverside block, Christchurch Hospital, and provides inpatient care for people with respiratory and/or other medical conditions. Ward 25 has 27 inpatient beds including 5 single rooms. The ward is also established as a Dedicated Education Unit, which provides an alternative model of teaching for nursing students on clinical placement. The Sleep Unit at Christchurch Hospital provides diagnosis and treatment for people with sleep disordered breathing and other sleep related conditions. The Sleep Unit has strong community links with general practices who can provide screening for some conditions. A team of Clinical Nurse Specialists, Maori Health workers and others, provide expert care (both inpatient & outpatient) to people with a wide range of respiratory and cardiac conditions. Help with newly-received respiratory equipment, e.g., patients who are discharged from hospital with home oxygen. The respiratory lab offers a comprehensive range of respiratory function tests, and is accredited by the Thoracic Society of Australia and New Zealand (TSANZ). 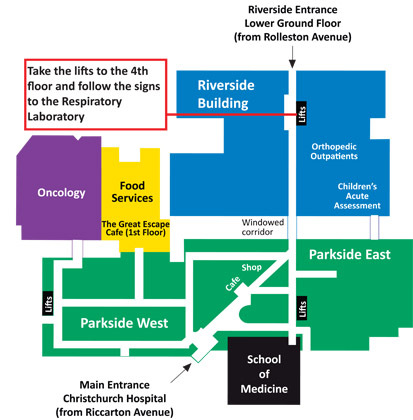 Location: The Respiratory Physiology Laboratory is situated on the 4th floor of the Riverside building at Christchurch Hospital. Hours: 8.00am to 4.30pm Monday to Friday.